I've been invited to read this Sunday, December 3, at the Holiday Festival of the Arts program in Covington. It’ll be held at the St. John’s Coffeehouse, which is at 535 E. Boston St. Covington, La. 70433. The phone # is 985-893-5553. The program features a bunch of local authors. Some will be telling stories while others will do brief readings. I’m one of the readers, and will be reading material from “The Adventures of an Arkansawyer,” a humorous memoir of my days growing up on a farm in Arkansas. The program begins at 12:15 and ends at 4:00. My actual reading will be sometime between 1:40 and 2:40. I’m not sure of the exact moments. The whole program looks pretty interesting, though. Cold in the Light: $8. The Adventures of an Arkansawyer: $6. If you’re local, I hope you’ll drop by. Would love to see you. If anyone who is planning to come wants a specific book, let me know and I’ll be sure to bring it. Well, I was off a few days for Thanksgiving and did get some writing done. Mostly, though I got resting and reading done, which I needed and enjoyed. I can't believe that break is already over. I hope your Thanksgiving went wonderfully. I did have a haiku published at Plum Tree Tavern. Here's the link if you'd care to check it out: Plum Tree Tavern. 204 pages. 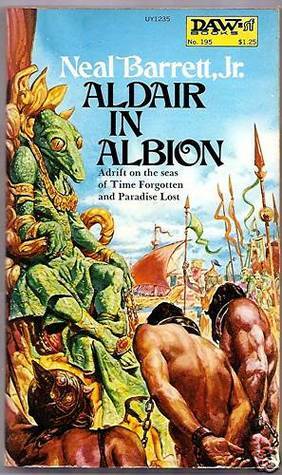 Front cover art by Daniel Landerman. This is the third book in the Dyscrasia series by Lindberg, following after Lord of Dyscrasia and Spawn of Dyscrasia. Here again we find the combination of beautiful language and powerful imagination that informed the first two books. The result is a unique fantasy vision that is both artistic and effective. The “Dsycrasia” novels are hallucinogenic, dream-like, full of wraiths and apparitions. Ideas and images pile one on top of another with an intensity that is far from common in fantasy literature. I admire the author’s ability to maintain that intensity throughout his works; his world-building never stumbles. This volume also introduces Helen, a young girl who immediately evokes both sympathy and admiration. I liked this touch because it gives readers a very human character we could strongly root for. Most of the other characters are inventive and complex but not entirely human. They are fascinating, but not as easy for the reader to inhabit. I’m looking forward to more adventures with Helen, and at the end of “Daimones” the author hints at things to come. I know there is a fourth book in the works. I’m looking forward to it. Here's the link on Amazon. I'm going to start a new feature both here on the blog and on facebook in which I’ll recommend my top five or so books in each genre that I’m familiar with. I'll limit it to one book per author in each of those genres. What I'd love to get back is other folks' recommendations in those genres as well. I'm always looking for new good books to read. 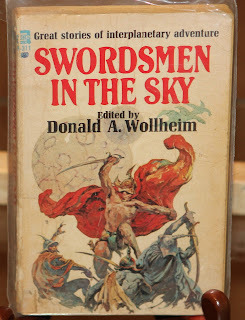 Below are my top five recommendations in Sword & Planet fiction. 2. 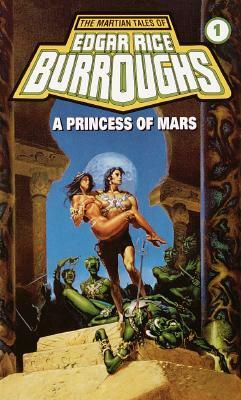 A Princess of Mars, by Edgar Rice Burroughs. This is the one that started it all for me. 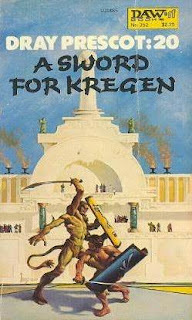 The first in the Barsoom series by Burroughs. John Carter gets to Mars and has his first adventures. I loved it so much that from the moment I read it I began making up my own stories about this kind of character and world. Eventually, the Talera cycle resulted. I owe ERB so much for the joy he gave me and the inspiration he was for me with these books. 3. A Sword for Kregen, by Alan Burt Akers (AKA Kenneth Bulmer): This is the first Dray Prescot book that I ever read, and it is still my favorite. Dray Prescot meets a better swordsman than he is, which was unique in my experience with Sword & Planet fiction up to that time. The book also involves a game of living chess, or the Kregen equivalent of that, called Jikaida. I still remember finding this book at a small used bookstore in Russellville, Arkansas when I was in college there. Just a great story. 4. Aldair in Albion, by Neal Barrett, Jr.: This is the first in a four book series that has to be one of the most unique S & P works out there. It’s a bit outside the standard realm for S & P fiction because it actually takes place on a future earth. However, the feel of it—to me—is sword & planet with a healthy dose of animal fable. This is a story about a world abandoned by humans but only after they raised many other species to sentience. The main character is an intelligent, upright walking pig. But although that sounds like food for hilarity, the story is full of adventure and excitement. 5. In the Courts of the Crimson Kings, by S. M. Stirling: Stirling knocked it out of the park with this one. 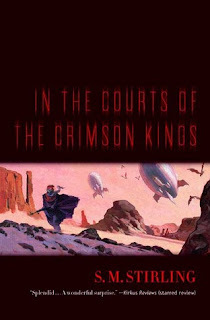 A wonderful revival of the Sword and Planet genre, and set on Mars no less. Great action, fantastic and wonderful characters, and a powerful ending. A truly enjoyable experience. This is the first in a post-apocalyptic series that seems clearly influenced by the movie Road Warrior. It's about fifteen years after the "nuke-out," which seems to have occurred in this book's timeline around 1984, when the book was written. It features a man known only as Traveler, an ex-special forces soldier who was exposed pre-war to a very nasty neurotoxin that often causes him great pain but which also seems to provide him with some extra-sensory ability to detect emotions. In this volum This is the first in a post-apocalyptic series that seems clearly influenced by the movie Road Warrior. It's credited to D. B. Drumm. It takes place about fifteen years after a "nuke-out," which seems to have occurred in this book's timeline around 1984. That's when the book was written. It features a man known only as Traveler, although we do learn his real last name late in the book. It's Paxton. Traveler is an ex-special forces soldier who, while in "El Hiagura" (El Salvador) before the war, was exposed to a very nasty neurotoxin that often causes him great pain but which also seems to provide him with some extra-sensory ability to detect emotions. In this volume, Traveler stumbles into a town where two opposing war-lords divide the town between them. Shades of Kuroisowa's "Yojimbo" and Leone's "A Fistful of Dollars." 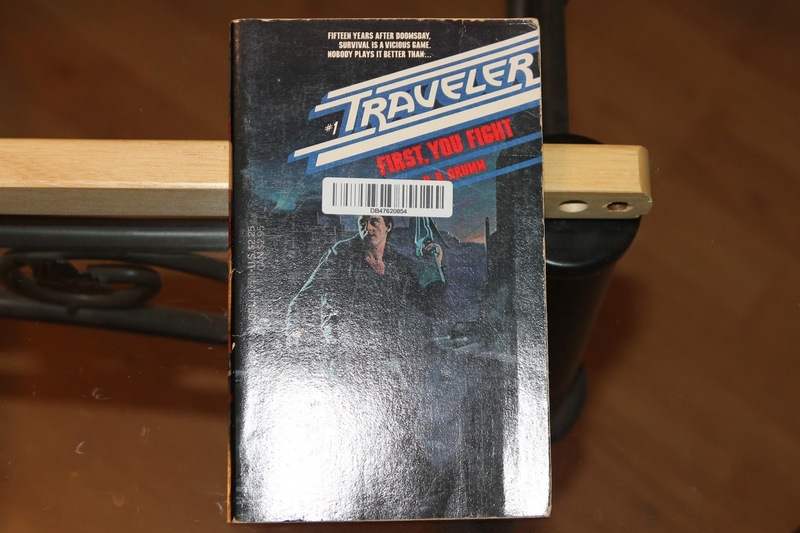 As one might expect, Traveler ends up pitting the two sides against each other. The book also reveals that a man who betrayed Traveler back before the war is still alive, and that he serves the ex-president of the United States, a man named Frayling, who appears to be a rather thinly veiled substitute for Ronald Reagan, who was president from 1981 to 1989. It further reveals that at least one of Traveler's friends from before the war is still alive. These two discoveries provide a set up for the continuing series. 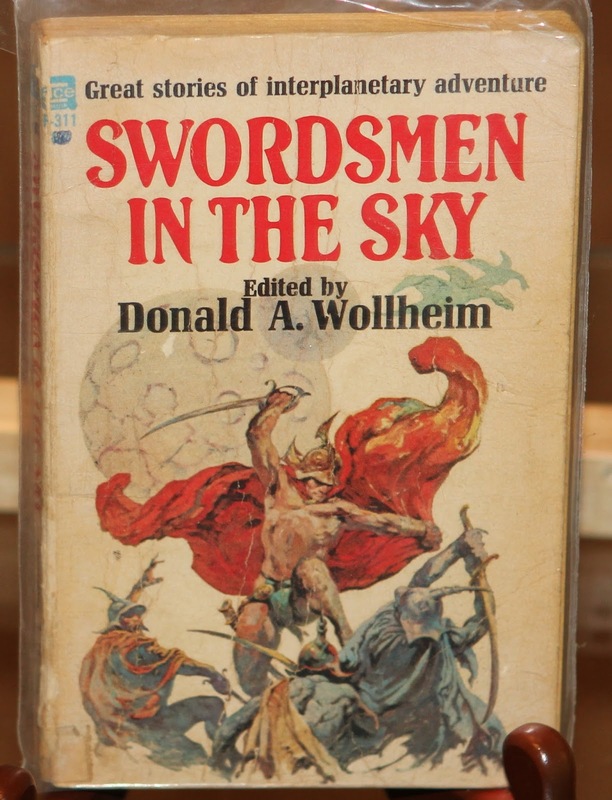 As with most of these men's adventures books of the era, D. B. Drumm was a house name for the series. It appears that Ed Naha wrote this first volume, and he and John Shirley traded off on the books through the rest of the series. I actually enjoyed this book quite a bit and will look for others in the series. There are apparently thirteen volumes. Although the story is pretty standard, the writing was good and the character interesting. Better done than many in the post-apocalyptic genre.